Lufthansa India executed Facebook logout ad today. 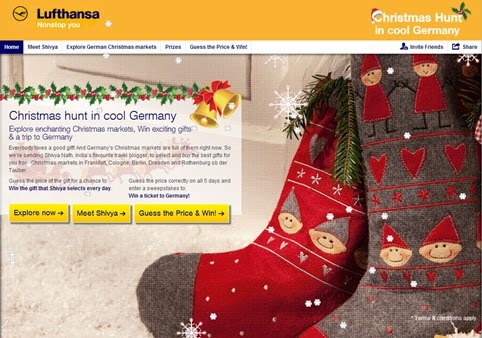 Typically brands look for engagement on the logout banner through pictures or video on click, but in this case the banner led users to Lufthansa’s official website and Facebook Page. The Facebook brand page is replete with great imagery and their new ‘Christmas Hunt in Cool Germany’ promo related posts. The new campaign showcases the best Christmas markets in Germany and the brand has engaged travel blogger Shivya Nath for this purpose. As a part of the promo, Facebook fans can guess the price of gifts that Shivya selects everyday from Germany’s famous Christmas markets and if they get the right answer, they can walk away with the gift and also stand a chance to win a free ticket to Germany. The promo application on Facebook also gives fans short bytes on popular German travel destinations. Shivya is covering her German travels on her blog ‘The Shooting Star’. This seems more like a social media activation since there is no reference to the contest or the blogger engagement promo on the Lufthansa India website. Nice, topical and well executed.